Green tea is the undisputed champ among health-promoting beverages, but has always been time consuming to prepare  until now. Green Breeze packs all of the benefits of this traditional drink into a convenient take-anywhere form. If you're consuming sports drinks, juice, coffee, or diet cola, you may be loading your body with unnecessary sugars and or chemicals that can degrade your future performance. Stop sabotaging your progress. Switch to green tea, the one natural beverage that's been proven to positively impact your health. There are many green tea products on the market, but Green Breeze is by far our favorite, thanks to its high purity, clean taste, convenient packaging, and low cost. Green Breeze starts with green tea leaves that are organically grown at one of China's premier tea farms. These green tea leaves are carefully selected, lightly steamed, dried, ground into an ultra-fine powder, and packaged in air-tight mylar foil packets to preserve freshness. Absolutely nothing is added or extracted. This is pure 100% natural green tea in its finest form. Good Bottled teas When tea is factory-brewed and bottled (or canned), its nutritional content begins to degrade. By the time it reaches the consumer, bottled tea has often lost as much as 90% of its nutritional value. Instant teas Instant tea has a long shelf life (compared to bottled tea), but starts out with less nutritional value due to the additional manufacturing processes need to produce it. Better Fresh brewed teas Fresh brewed teas have better taste, aroma, and nutritional value than bottled or instant. However, when you drink conventional brewed tea, you discard the used tea leaves, which still contain a significant portion of the tea's nutrients. 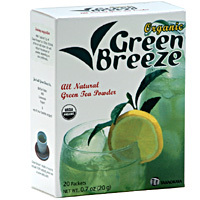 Best Green Breeze® With Green Breeze, you get the taste of fresh brewed tea without the brewing hassle. And because you consume the entire tea leaf, you gain benefit of all of the tea's nutrients. Warning Other powdered teas Many powdered green tea products (including major brands that appear in grocery stores) contain only a small amount of green tea, blended with inexpensive fillers and various additives. Don't settle for anything less than 100% organic green tea. All green, oolong, and black teas come from the leaves of Camellia Sinensis, a plant that's rich in epigallocatechin-3-gallate (EGCG) and other catechin polyphenols. EGCG is an especially powerful antioxidant, with approximately 100X the potency of vitamin C. The catechins in oolong and black teas are destroyed during their fermentation process. Green tea, however, is produced with minimal processing, and retains a very high concentration of these beneficial antioxidants. Green Breeze contains 97mg of catechin polyphenols per serving, 25mg of caffeine (approximately 1/4 of the caffeine in one cup of coffee), and zero calories. More than 1,000 research studies have linked green tea consumption to health benefits, including reduced risk of cardiovascular disease and reduction or prevention of many cancers. For a an extensive summary of these studies, please see The World's Healthiest Foods: Green Tea, or Life Extension: Green Tea. For abstracts of the very latest research, search "green tea" on Pubmed. 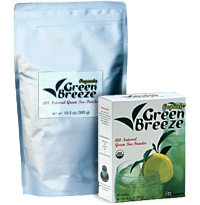 Green Breeze can be used for either hot tea or iced tea. Just add one packet (1g) of Green Breeze to 16oz of hot or cold water. Add sweetener if desired. And stir or shake to mix. Enjoy! Because Green Breeze is a completely natural product, you can expect some settling to occur after mixing. For best results, re-stir occasionally. A shaker bottle makes it easy to mix Green Breeze without splashing or spilling a drop. For the ultimate iced tea experience, use a Blender Bottle and a generous amount of ice. The pre-measured single serving packets make it easy to take take Green Breeze anywhere, including your car, office, school, or gym. It's super convenient, and costs less than $0.23 per serving. The bulk pack saves you even more money (less than $0.14 per serving! ), and is perfect if you want to experiment with adding green tea flavor to other foods or recipes (e.g. protein shakes, ice cream, yogurt, salad dressings, or baked goods). Save 10% when you purchase two or more packages of Green Breeze. Simply make your selections below, and your discount will automatically be applied during checkout. This product line carries STI's Complete Satisfaction Guarantee. Try it in your own home for 90 days. If you are dissatisfied for any reason, simply return the product to STI, and you'll receive a prompt refund of its full purchase price (excluding the original shipping and handling charges). Sales tax of 5.00% will be added to your order if it is shipped to an address within the state of Louisiana. A shipping and handling charge will automatically be added to your order during checkout. This charge, taken from the following table, covers the shipment of your order via UPS Ground or USPS Priority Mail to any single destination within the continental United States. Additional charges will apply for shipments to Alaska, Hawaii, or non-U.S. destinations, and for rush shipments or other special conditions. Please contact for details.